CEO and entrepreneur Emma Isaacs forgot to draw up her life plan, and she doesn’t have a list of five-year goals. She doesn’t believe in work/life balance – after all she has five children and heads up Business Chicks, Australia’s largest community for women. 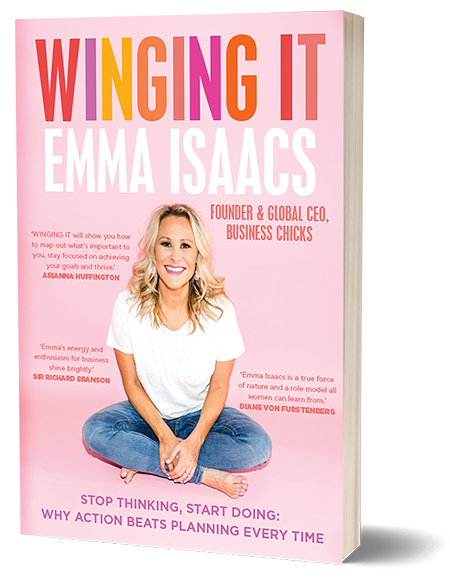 Like Sheryl Sandberg, who told us to ‘lean in’ to find success, Emma wants to show us that you can’t plan every detail and wait for the confidence to kick in before you begin; instead, take action now, do what feels right and figure the rest out as you go along. In other words, you’ve got to learn how to ‘wing it’ rather than wait. Emma shows us that often the only thing holding us back is ourselves; that you can follow your dreams; and that there’s no reason not to start doing so right now. I started a company at age 24, built a global skincare brand, became a US Presidential Ambassador and had my children over the age of 40 – all because I never knew I couldn’t do it. I was Winging It all along! I never had a clue how to do it until I did, and now I know I’m not alone. Emma doesn’t just make it all look so easy – she charges into her life as a great big adventure and we can’t help but jump in too! Her energy is contagious, her optimism infectious and her ‘no holds barred’ bravery makes us all determined to NEVER shrink ourselves no matter what the odds are. Winging It is the call to arms we all need. It’s the encouragement we seek and the reassurance we crave to truly step forward, arms outstretched, and ask for what we want. Emma Isaacs has created an ongoing forum to allow women’s voices to be heard. She has championed the empowerment of women for many years and will continue to be an innovator and disruptor for years to come. Emma Isaacs doesn’t just encourage us to move out of fear, she demands it of us. Winging It is the reminder we all need that life is short and we have to pack in as much living as we can. She’ll equip you with the tools to use and show you the shortcuts you need to get ahead and start thriving.